Values are a Key to Success- What are Yours? Values are a key component of how we think, what we believe and how we show up in the world. When you create you life and business based on what you value, you experience greater connection and passion. Interestingly, your values can also be a window into how you are feeling on a particular day and thus what is important to you right at this moment. So for fun, take a look and share what are the first 3 words you see. Are you surprised? OR did they reinforce what you already know is going on for you right now. Share what you see and your reaction to it. Consider how you might use this as you move through your day. ENJOY! So what are the first 3 words YOU see? Love it! 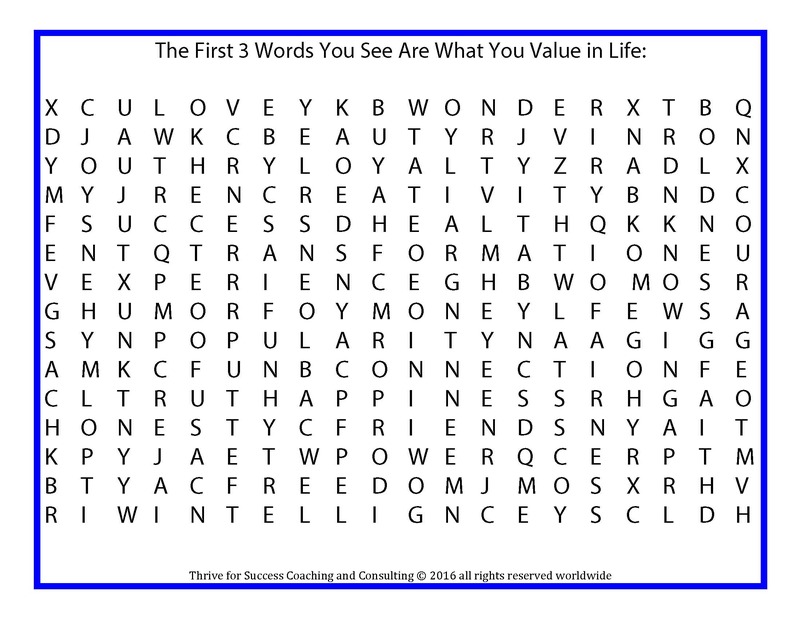 First three words I see are: Connection, freedom, and friendship. First three words I see… Creativity, Connect and Freedom. Here is my first real blog post! Comments would be much appreciated! well am an aspiring blog blogger but I’m still new to the whole thing. Sue Guiher is an international speaker, board certified life coach and business strategist who helps other speakers, coaches and consultants grow their business from the inside out, not by doing more tasks but instead creating a message and a business based on your core strengths. After a successful corporate career, Sue realized that she wanted more from her work; time to help others while also having time to be with her family. Sue is different from many other coaches because of the comprehensive nature of her work. Sue “gets” business but, perhaps even more importantly, as a powerful Intuitive, Sue “gets’ what her clients need and is able to provide it. She helps her clients connect to their unique core greatness enabling them to create a business that supports them and their values. She has worked with business owners in over 96 different industries. She has worked personally with Michael Port as his director of education, helping train his coaches. Sue also has trained hundreds of coaches (many of whom are well-recognized) at various coaching schools. Sue also teaches business leaders in the MBA programs at The Wharton School at the University of Pennsylvania. Sue is a life-time resident of Bucks County, PA (outside Philadelphia). She lives there with her husband, 3 children and their dog, Sailor. She enjoys the feel of the country while also enjoying the benefits of having a city close by. ©2019 Thriving Entrepreneur. All rights reserved worldwide Powered by the Get Noticed! Theme.